My Last sword.......Just Broke!! it happens, but this Angus thrim cutter treated me so well I felt i needed to honor it in this post! Still looking for the last 12inches of the blade. this may also be the next sword ill collect if i can Find it. Hmm looks like you have been breaking rocks and what happened to the pommel? Well, if it treated you so well, perhaps you could recycle it into a different sword or other such weapon? How on earth did you break a sword like that? Somehow that picture fits well into that "10 years since the first LotR Movie" Thread. The blade that was broken, maybe it will be reforged? On a different note, I can't help but join the choir of "How did you manage to do that?" Hell--I'd leave it as-is and have a short scabbard made for it. It has character. La Chanson de Roland reenacting? i know it's already been said like 10 times in this post but for the sake of St. Paul's beard, what the heck did you do!?!? i've seen steel break from over stressing caused by deflection but the way you chose to photograph it makes me want to stab at a joke. you haven't been using it to cut paving stones or a jack hammer tip i hope. Ha. You beat me to it. Light the beacons and send word to the elves! Atrimduril shall be reforged! Add me as one more gawking bystander who wants to know how it got broken. I mean, swords break. The pommel coming off or the blade breaking out of the blue for no obvious reason wouldn't surprise me much even if it were a top of the line custom or Albion, but both? Please tell me there is an interesting story here. Mother of God, man! "Still looking for the rest of the blade"? What happened to that sword? Since we haven't had an answer yet about what happened to the sword, I do believe it's time to start speculating. I think you guys are interpreting it incorrectly. He wasn't cutting stones. Looks to me like it fell off a cliff and landed on that stone. 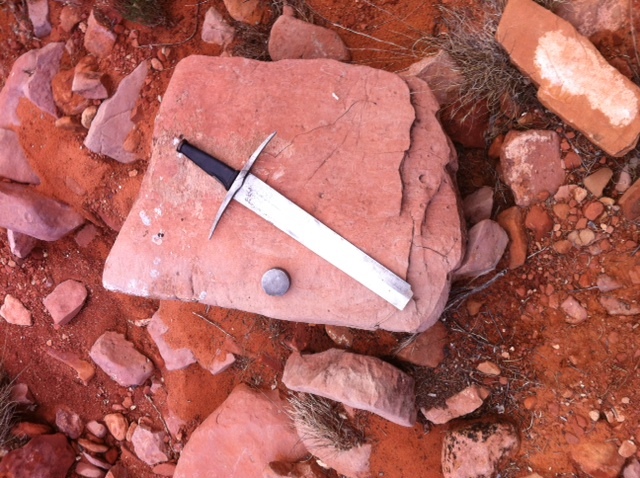 Perhaps he was out for a hike on a ridge, and sword enthusiasts being sword enthusiasts, he was wearing his sword. Possibly he had to draw the sword rapidly to either defend against a swooping dragon or a small tree branch blocking his trail. The draw was made awkward by the back-scabbard he usually carries the sword in, and he fumbled. Over the edge of the cliff went the sword, with the results shown in the pictures. Sounds plausible to me . Not to sound like a broken record...but how the heck did you do that?!? If he's still looking for pieces, perhaps he loaded it into a ballista and went duck hunting. Or whatever you hunt with flying swords. Or whatever you hunt with flying swords. I'll bet anything a ninja cut it in half with a katana. Can't be anything else...unless maybe they had lasers!